With most urban festivals, the music ends around your usual high school curfew time and leaves a whole city full of people wondering where the tunes went. Ultra Music Festival is no different, and the afterparties are getting started days before festival opens. Here are a few that caught our eyes. Remember to check Ultra Music Festival’s website for their official afterparties. UMF only officially sponsors one after party per night of the festival, but that is far from the extent of after-hours raving going down in Miami during weekend. All of these parties will be taking place at Grand Central in Downtown Miami, walking distance from Bicentennial Park where the festival is held. This is a great way to kick off your Ultra weekend. 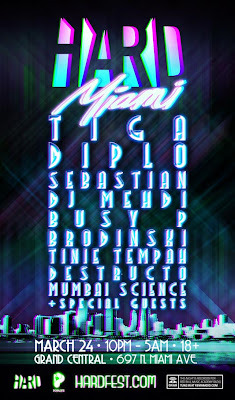 Headliners Tiga, Diplo, Sebastian, DJ Mehdi, Busy P and more will be turning up the heat in Miami a night before the festival. Tiga was tearing up the dance charts in 2009 with his newest album and a string of club-tested remixes, but this appearance suggests new material maybe coming soon. Expect anything from Techno, Electro, Disco and anything else that’ll make you shake to a bit of the UNZ. Head of Mad Decent records (Diplo, Rusko, etc. ), Diplo will be bringing his unique blend of exotic beats, classic tracks and re-edits and a whole lot more. It should also be noted that Busy P is the founder of Ed Banger records which houses Sebastian and DJ Mehdi who are also on the lineup. Ed Banger is also responsible for big names like Justice and Mr. Oizo to help give you an idea of the label’s sound. These artists will be dropping the serious Electro that will probably have some people waking up a little late for Ultra the next day. After the first night of Ultra Music Festival, there will be one party in particular that is almost big enough to be it’s own festival. It’s the 9th anniversary Future Sound of Breaks which is also being called The Future Sound of Bass for 2011. Ninety different artists will be playing on five different stages with a heavy focus on Dubstep, Drum ‘n’ Bass, Jungle and the like. Some of the headlining names include the Live-PA madness of Dirtyphonics, Drum ‘n’ Bass super group Planet of Drums (Dieselboy, AK1200, Dara and Messinian), and Bare and Smash Gordon in a combined set. Ann Arbor/Detroit resident Sinistarr will be featured at the Drum ‘n’ Bass arena. 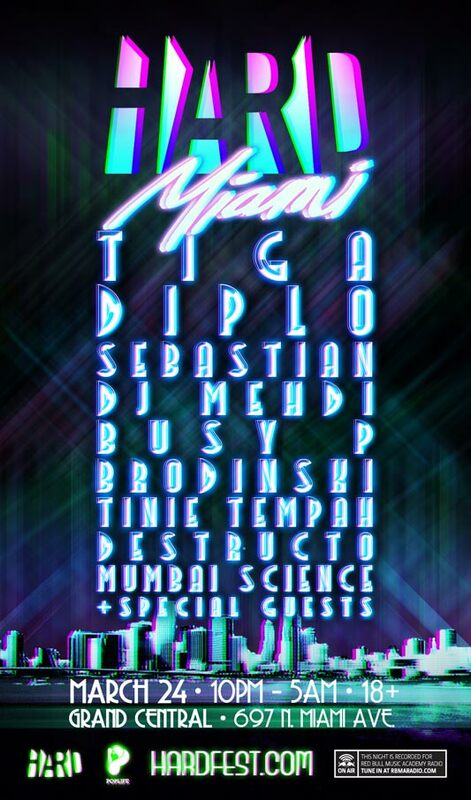 This show will also have an Electro dance stage and a Breakbeat-focused stage to round out this massive line up. With a Disco Biscuits festival appearance and two side project appearances (Conspirator and M80 Dubstation), the boys from Philly were already on triple duty for Ultra weekend. However, these guys know how dedicated their fans are and realize that they want more than a short festival set appearance out of a trip to Miami. What better way to get around the Ultra exclusivity agreements than bringing the Disco Biscuits alter ego band Tractorbeam. 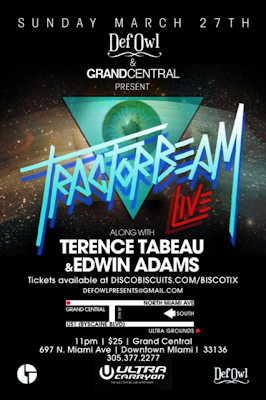 Tractorbeam is all the same members of the Disco Biscuits playing their music instrumentally with synthesized and vocoded vocal melodies being handled by mastermind Aron Magner. They started this project with the attempt of replicating a Disco Biscuits DJ set as a live band. This will be the largest time slot the band is allowed all weekend and seems to be the last stop of the weekend for the true Disco Biscuits fan. How many other chances will someone get to see the Disco Biscuits followed by a performance of Crystal Castles or The Chemical Brothers, and then get to see the Disco Biscuits again for a headlining Tractorbeam gig? Green with envy comes to mind.